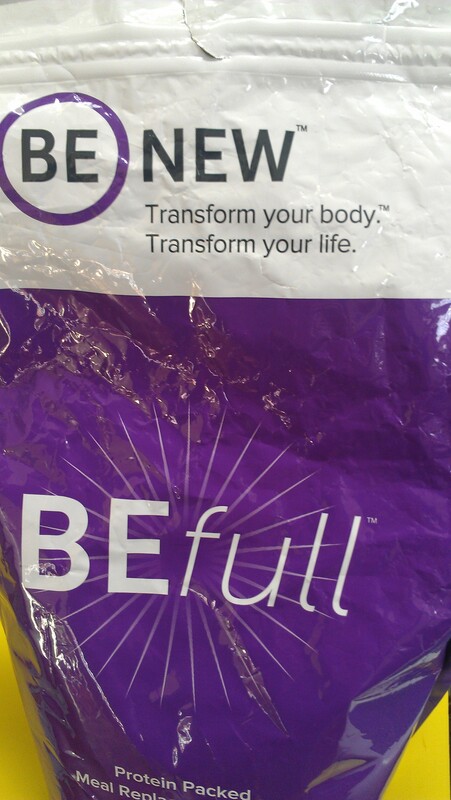 My half-full bag of BEFull chocolate meal replacement powder. Yummy with almond milk! I had an amazing, beautiful, celebrative day–and came in under calorie count! I love my BEFull shakes. I like them best with some frozen berries and a little rolled oats thrown in, which is healthy and relatively low in calories. But when I want to save calories for later in the day, it also offers the perfect solution. With almond milk (only 45 calories for 12 oz) and the BEFull powder (145 calories for chocolate or 120 for vanilla), I have a low calorie meal that leaves me feeling strong while using up very few calories. Today I did just that. We invited Jerry’s brother and wife for dinner. I made London broil and red potatoes, served with salad and pomegranates, yum! 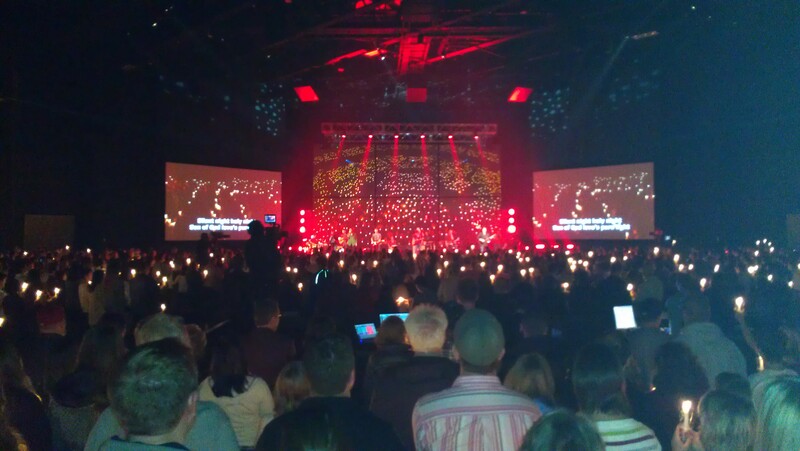 Then we were all off to an incredible Christmas Eve service at my church. The music was glorious, and the sermon SO good. I love how our pastor presents God’s grace, shows how we can’t earn God’s salvation, but only have to receive the gift God offers. The whole family, including Sarah’s fiancé and our dear next door neighbor, sat together. She can sound a little gruff sometimes, but she has a heart of mush–and is one of those loyal, giving people. 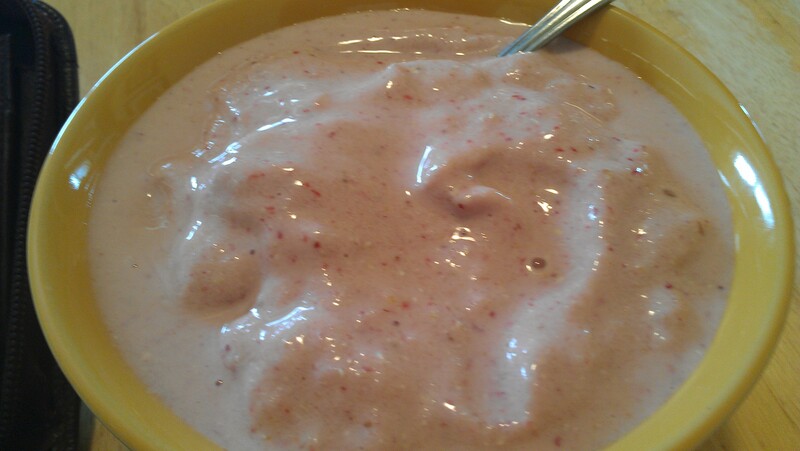 BeFull vanilla with almond milk, frozen strawberries, and just a little raw oatmeal to help it stick with me longer. I still love my BEFull shakes. Yesterday I rushed out the door at 5:30 a.m. armed with 12 oz of almond milk and a serving of BEFull. When I was ready for breakfast it was as easy as popping the power into the milk and shaking! The BEFull meal replacement is not only full of really good protein–the healthiest kind, pea protein–but also has some of the nutrition in Life Force’s wonderful supplement, Body Balance. It makes me feel really good with plenty of energy and strength. I like the chocolate best when I’m running around and have the shake straight. The vanilla is my favorite for when I’m home and add frozen fruit for a treat that is almost like ice cream, only low calorie and good for me! What is one of your favorite holiday traditions? Do you have a favorite “go to” meal when you’re in a hurry and want to eat low calorie and healthy?